Business management is a versatile field that offers opportunities for individuals with a variety of interests and skills. Talented business managers are in demand and may remain so as the global business environment becomes more complex. If you get along well with people, have an interest in business and technology, and have excellent communication skills, you could be a good fit for a career in this field. The ability to think critically and a willingness to work independently are important factors in determining success in business management. In addition, an enjoyment of solving complex problems and an understanding of complicated financial data are helpful. Business management is the process of developing the strategies, plans, procedures and policies that guide a business on both a day-to-day and long-term basis. It involves coordinating human, financial and material resources to achieve organizational objectives. What Will I Learn by Obtaining a Business Management Degree? Majoring in business management offers a broad foundation in business basics such as accounting, budgeting, marketing, planning, hiring and leadership. When pursuing an advanced degree, you may choose to specialize in any of these areas, as well as in human resources, healthcare management or computer information systems. Working in teams is a mainstay of business management education and a valuable way to prepare for the real world. Your coursework may include accounting, finance, business law, economics, statistics, principles of management, organizational development and human relations. Through your business management classes, you’ll be honing your problem solving, critical thinking, forecasting, project management and entrepreneurial abilities. Because business management is such a versatile career, you can choose the educational path that best prepares you to achieve your career goals. Earning a two-year associate’s degree in business administration or business management can offer opportunities to break into the business world. Advancement often requires a bachelor’s degree, which can be pursued while working in the field. A four-year bachelor’s degree, such as a BA in Business Administration Management, may open the door to additional career options, since employers hiring for business management positions usually require a bachelor’s degree at minimum. Additional education, professional certification or an advanced degree may be required to advance your career. For top-level positions, employers may prefer candidates with advanced degrees. With an MBA in Management, an MBA in Marketing, or an MBA in Healthcare Management, you could be positioned to compete for senior-level jobs. An advanced degree typically takes an additional one to two years beyond the bachelor’s level. Some employers may offer tuition assistance to help you obtain a master’s degree while establishing yourself in your career. Business management career opportunities vary in level of responsibility, salary expectations, and education and preparation required. An associate’s degree may qualify you for labor relations specialist, office manager or administrative specialist jobs. Positions such as business analyst, account executive, HR manager and management consultant typically require a four-year degree, such as a BA in Business Administration Management. You could qualify for executive-level positions, such as chief executive officer, senior management consultant, director of operations or brand manager, with an advanced degree, such as an MBA in Management or an MBA in Marketing. Additional potential careers include management analyst, retail store manager, hospitality manager, human resources administrator and small business manager. Business management can be applied in areas such as organizational behavior, human resources, operations and strategic planning. You can work in a variety of industries, including manufacturing, medical and health, charities, hotels, government, chemical, computer and information systems, fashion, grocery, advertising and promotions, utilities and construction. Opportunities exist in the public, private and nonprofit sectors. With a field as varied and open-ended as business management, consider your strengths when selecting a specialization. If you enjoy dealing with people one-on-one, human resources may be a good fit. An entrepreneurial focus is suitable if you are planning on starting your own business. It is critical to research specific management roles to select a path that suits your interests. 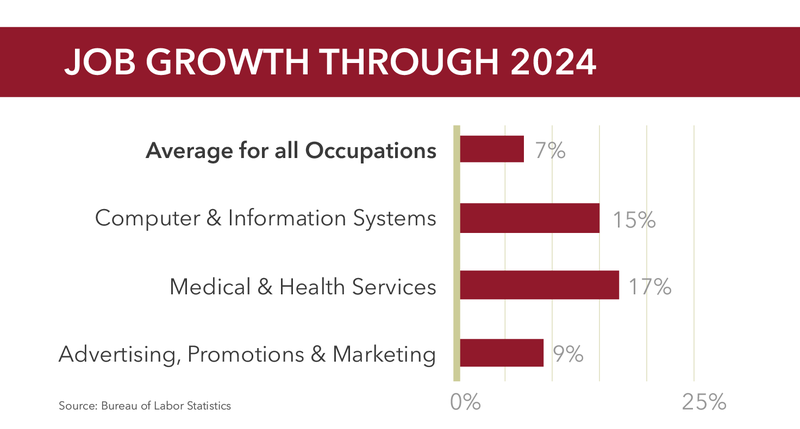 Business management majors can expect to see solid employment growth across a variety of industries in the coming years, according to federal projections. Potential salary ranges for business management professionals will vary according to several factors, including the specific industry, regional market conditions, and a candidate’s educational qualifications and employment history. *Please note that the hyperlinks remain updated, so the most recent salary information will be found by clicking on the job title. This information is updated every one to two years by the BLS. Your professional responsibilities may include supervising staff, analyzing data, planning operations and making crucial business decisions. Business managers may take care of day-to-day tasks such as hiring, training, purchasing and quality control in smaller firms. For larger organizations, formulating policy, planning for resource needs, setting overall direction and implementing strategies are some of the tasks often required of business managers. Because salaries vary depending on the specific position, as well as location, education and experience, prospective students are encouraged to conduct independent research to determine actual earning potential. Business management professionals need a wide variety of up-to-date business expertise to succeed and advance in their careers. Additional requirements will vary according to each individual position, but employers generally seek strong decision-making and organizational ability. Candidates for a career in business management must develop outstanding interpersonal and communication expertise, as well as creative problem-solving ability. After obtaining work experience, an advanced degree such as an MBA or both, business professionals may advance to positions with more responsibility and higher pay. Some graduates may pursue further study in finance, human resources, marketing, international business or computing to develop their expertise in a business specialization. For instance, labor relations specialists may be promoted to human resources directors; department managers may become operations managers; management consultants may be promoted to chief financial officers. As a business management major, you could find yourself positioned for opportunities throughout your career, up to and including the executive suite. If you’re interested in making a difference in the exciting world of business, earning a business management or business administration degree is a great place to begin. A business management major provides the broad knowledge employers need, while giving you the option to specialize in many interesting and rewarding areas.